Most people are aware that on the eve of September 5th, Test Alliance Please Ignore under the military leadership of Vily, engaged in open capital warfare against Circle of Two lead by notorious Serbian FC and alliance leader Gigx. Test Alliance won a resounding victory that night, and defeated Co2 30 billion – 300 billion +, wiping out nearly the entirety of Co2’s US time zone capital fleet. It was a major success for Test Alliance in securing a beachhead deep into Co2 space, and a near total disaster for Co2. For those who don’t know, Vily is one of the best FC’s in New Eden and a well known and respected military commander, but few people are aware of those who work directly under him and are major contributors to his success. An after action report by Vily can be found here. Today, we are going to meet one of those individuals who significantly contributed to the success of this fight and whose efforts most assuredly turned the tide in Test Alliance’ favor. His name is Farmstink, and his efforts are the very reason that the battle of XWY took place at all. Several days prior to the battle of XWY, Test and Co2 were fighting each other over minor timers and were heavily engaged in another region of New Eden. 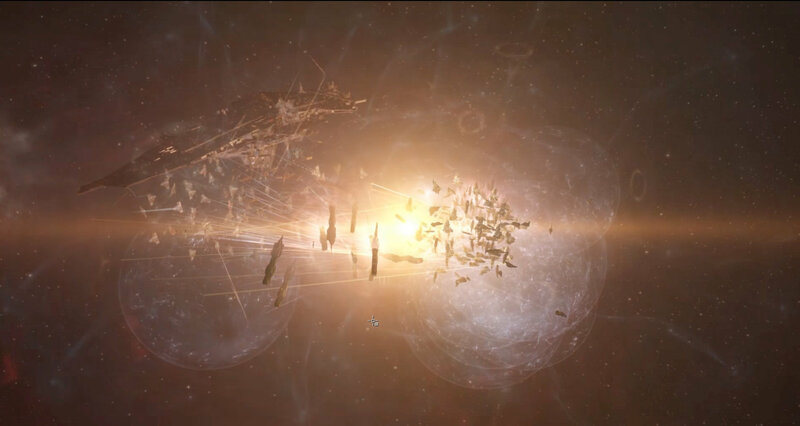 Farmstink, one of the lesser known FC’s in Test military structure took out a small fleet to troll sov while another engagement was taking place, and managed to capture and secure an Ihub in XWY, allowing for the anchoring process to be reduced to 24 hours for a citadel. Thus SUAD bridged in and dropped a Fortizar and onlined it right under the noses of Co2, which allowed for a staging system to be secured right in the heart of Co2’s space. This is his story. Sanai Nobuseri: So, without spilling anything that would be considered opsec, how did you get involved with the current campaign for the invasion of Impass, and what part did you play in the planning stages of the current campaign? Sanai Nobuseri: How did you get chosen or volunteer for that task, and what were the steps you took to do it successfully? How did your personal battle pan out in delaying Tri? Farmstink: Two big things I did for that, the first was blapping the XWY hub prior, the second was of course the interdictor work. Generally speaking, I have been taking initiative on these things, no orders needed. The Ihub was one that I had brought out a small gang to reinforce, and the kill timer came out at a great time – right when an FCON fort was coming out of its final reinforce, or maybe Sotiyo or something. So while Tri and Co2 were posturing for that kill, and Test and everyone else were focused on pulling defensive fleets in range, I took 10 Test pilots, five in entosis and five (including me) in light combat ships and we killed the hub under Co2’s nose. I was FC-ing that from a sabre and it got down to 7 structure points, but lived. Sadly for the story that was not the same sabre I used to mess with Tri later. At any rate, that was an interesting small gang capture of the XWY hub, and it was contested by a kitchen-sink home defense gang, they just weren’t coordinated enough to stop us. So we got that hub, yay! Co2 actually reinforced and killed our hub there once, but then when they dropped the next one, we put our entosis on it and threatened a supercap escalation. Co2 stood down, so basically they donated us a new ihub there. And since the ihub was kept there in our name, it meant we could drop citadels with only a 24h timer. Sanai Nobuseri: Nice, and that is what lead to the confrontation and test dropping the staging Fortizar. Farmstink: Yeah, XWY is in titan bridge range of DTX so Vily picked a night and dropped that fort that we had the fight over. Sanai Nobuseri: And your role in the XWY fight? As it turns out that opportunity did come up – they hadn’t midded dreads at all. So they undocked everything starting 02:00, which was waaaay late for a timer in 30 minutes. Their route would have had to use three titan bridges to avoid gates, and you can’t do three titan bridges in 30 minutes. So I rageformed six interdictors, including myself, and we started moving to likely positions on the route. There were a few routes they could take, but as soon as they picked a gate out of their staging in Detorid it became obvious which one. Since Tri didn’t bring much anti-tackle, each interdictor was able to catch them with at least one bubble, often two or three, and each bubble keeps them trapped at least two minutes, and of course you can keep the interdictors alive with various cloaking and gate jumping tricks. It got so bad with them trying to gate dreadnoughts that at one point Vily asked us over comms to stop bubbling them and let them into Feythabolis. That’s the only reason they even got through that gate to be honest. They still had to move several jumps further into Feyth by gates to get into dread jump range of XWY, and I had ‘dictors reshipping and burning back like mad to keep Tri bubbled whenever we needed. The rest was just execution, I was pretty proud of the other pilots too. I didn’t have any idea how good my guys were at this sort of thing, but the ones posted in T2 and JI had perfect bookmarks and positioning. Honestly great pilots. Farmstink has been playing eve since late 2008 and has spent the majority of his time flying under the banner of Test alliance. He created his character originally as a joke alt in order to screw around, but ended up sticking with it after giving his original characters away to a friend due to IRL issues. Farmstink came back during the fountain war and began FC’ing under Test alliance as he saw a need to do his part and help. He went inactive again until World War Bee, and returned for that great conflict. Getting heavily involved with Delta Squad (Test Elite Pvp Wing) he earned his title as Strat FC under Test and the rest is history.